We meet Harley and Renee Atwater, both in their early 30s, on a warm, sunny, Saturday morning, as they are preparing their "Yard Sale." The reason for the yard sale is simple -- In two days their divorce will be final and, at their mediator's suggestion, they've decided to sell all of the possessions they've acquired during their 11-year marriage and split the profits. Then they will each be off to start their new lives apart. Only one problem ---- neither one wants to part with their 1994 Jeep Wrangler. So now what? Fortunately, Harley, a long-struggling comedy writer, comes up with a novel solution: whichever person makes the most money by the end of the yard sale gets to keep the Jeep. So, with the bet in place, Harley and Renee (a loving, level-headed woman) proceed to "sell off pieces of their lives" to the quirky, offbeat, and often hilariously bizarre people that always arrive at yard sales! 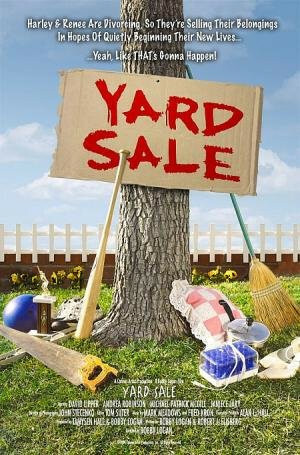 And during the constant haggling with buyers over the dozens of items that Harley and Renee are selling, the items often lead to "flashbacks" of incidents that occurred earlier in the couple's marriage,giving us a unique insight into how and why their relationship spiraled downward, ultimately leading to their pending divorce and this unique "Yard Sale." Regions are unavailable for this movie. Click the "Watch on Netflix" button to find out if Yard Sale is playing in your country.